There are many reasons you should include native plants into your landscape plans. For one, most native plants require little maintenance because they have evolved to thrive in our local habitats and growing conditions. That means after the first year of making sure they are well watered and have put out roots, very little watering and care is needed. Perhaps the most compelling reason is that not only do native plants look good, they also do good for wildlife. So what native plants should you consider if you live in Massachusetts? Here are five of our spring and summer perennial favorites that will come back year after year. Similar to its cousin, the dusty pink-flowered common milkweed (Asclepias syriaca), butterfly weed is a host plant for monarch butterfly caterpillars. A host plant is a specific plant that a species of caterpillar will eat. Butterfly weed requires full sun and can grow as tall as one to two feet, with orange or yellow flowers that bloom in summer. Don’t let the “weed” in joe-pye weed fool you. The term in this case refers to the fact that it’s commonly found, not that it’s unwanted. The dusty pink late-blooming flower attracts pollinators and clouds of butterflies in the late summer. The Gateway variety will grow to six or seven feet tall, where as Little Joe reaches only three to four feet. Attracting small bees and butterflies, this little bottle-brush of a white flower is held above a nicely toothed leaf. There are many new varieties of foam flower that have interesting red markings on the leaves. It can spread and become a beautiful spring flowering ground cover. 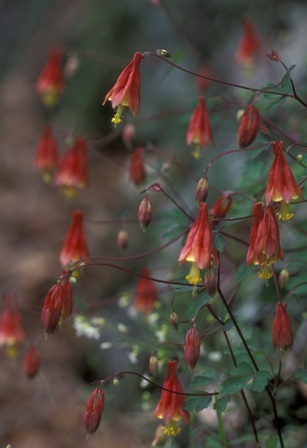 The native columbine has an orange-red flower with a yellow center and is attractive to pollinators and hummingbirds. After blooming, the delicate blue-green foliage continues to look beautiful all summer long. And while there are many attractive species of columbines, the only one native to Massachusetts is the Aquilegia canadensis. This native is one of the most delicate-looking ferns. Its thin black stems and bright green foliage add a light frothy texture to a shady garden. Many local nurseries sell native plants. Before you purchase one, make sure they were cultivated from seed. We like the wild plants to stay wild! Do you have a favorite native plant? If so, share in the comments! This entry was posted in Gardening on June 13, 2013 by . Don’t forget the beautiful Jack In The Pulpit,I have many in the 3 foot tall range and hundreds of Mayapples,not colorful but interesting to have in your garden.Lambs’Ears are also very colorful and will grow anywhere. Wild violets are great border plants, both the deep blue and white/blue ones. They are early spring bloomers, then have green leaves to the first hard frost. New England Wildflower Society is in Framingham, MA and a fun place to visit. We have gotten some great native plants there. Where close to Boston are the best places to find native plants for sale? Garden in the Woods in Framingham. I agree with Ray Theberge, pictures would have been very nice. I was surprised and disappointed that there were none. Guess I need to search the web for them. Thanks for this posting encouraging folks to plant native species. While some folks will be motivated to “go native” in their landscaping just on the pure “boosting biodiversity” argument, others might need some additional persuading. Perhaps finding out that many native plant species are edible (and tasty) will provide the additional motivating factor. http://www.ecolandscaping.org/wp-content/uploads/2013/03/Edible-Native-Plants-of-Mass.-Northeast-U.S.-and-E.-Canada-March-18-2013.pdf – perhaps it will be of some use to you in selecting which native plants you’d like to add to your landscape. False Blue Indigo is gorgeous, so is Gaillardia. And what about Wild Bleeding Heart? The best part of native’s is that after they are established, they rarely require special care or even extra watering. How could you miss Solomon’s Seal! So graceful with its curving frond and suspended flowers, and the beauty lasts and lasts as the flowers turn into navy blue berries. The berries are easily planted about an inch deep in fall. It’s perfect for those of us managing shady woodlots. False Solomon’s Seal is also attractive. Thanks for this post. These are very applicable to NJ too. I just bought a new home and have a spot set aside for a butterfly garden for next spring. I would enjoy a post your favorite native shrubs or small trees that are attractive to butterflies and birds too. Good topic, but it really would have helped the articles if there were photos next to each of the five plant descriptions.